Fig. 11-9. I-V Plot for a Planar Array. The power available Is simply the area under the curve. We must also consider how temperature affects the I-V characteristics. While the spacecraft is in eclipse, the solar-array temperature can get as low as -80 °C. The highest operating temperature for an LEO spacecraft solar array is 100 °C, occurring near the end of a full Sun period during an orbit. The temperature coefficient, or percent degradation of performance with increasing temperature, for any solar cell depends on factors such as the type of cell and its output-power characteristics, actwri operating temperature, and radiation environment. Gallium arsenide and indium phosphide have lower temperature coefficients, but higher temperature still means reduced performance. Solar arrays using gallium arsenide and indium phosphide also resist radiation better than silicon and provide greater EOL power for a given area. We must establish a profile for operating temperatures during a mission, so the photovoltaic system can generate adequate power throughout. The peak-power point depends on the array's operating temperature at BOL and EOL. Thus, an array often provides maximum power coming out of an eclipse period because it is at its coldest operating temperature. Transient voltage excursions often occur when leaving eclipse, so we may need to clamp voltages to protect spacecraft loads. By understanding how the array's performance relates to these variables, we can get the highest output power from the array. Usually, solar cells in series-parallel combinations make up a solar array. The number of series-connected solar cells in one string establishes the bus voltage required at EOL at the operating temperature; the number of parallel strings depends on the required current output. Isolation diodes mounted within the solar array typically minimize the effects of shadowing and reversed-biased solar cells. Solar-array configurations are either planar or concentrator, and either type can be body- or panel-mounted. Most photovoltaic applications to date have employed a planar array in which solar cells are mounted onto a surface (typically insulated aluminum honeycomb) with an adhesive. A Kapton, Kevlar, or fiberglass sheet usually insulates the solar cell from the aluminum honeycomb support structure. Concentrator solar arrays increase the solar cell's output by using mirrors or lenses to focus more solar radiation on the cells. Panel-mounted solar arrays usually apply only to 3-axis stabilized spacecraft The panel-mounted approach tracks and points the solar array to get the best Sun incidence angle. The body-mounted approach reduces the requirements for tracking and pointing on any spacecraft (spinning or stabilized). But the less effective Sun incidence angle and increased array temperature of body-mounted cells produce a lower efficiency in orbit. Panel-mounted solar arrays are usually mounted on a boom. Deployable panel arrays are either flexible or rigid, according to the type of substrate material employed for mounting. For most spacecraft, we try to place the solar array away from the payload and other spacecraft subsystems because of the variable and often high temperature of the solar cells. Body-mounted planar cells are typical on spinning spacecraft, which provide thermal control by radiating excess heat to space as the spacecraft spins. Body-mounted solar arrays use cells inefficiently because of higher temperature and reduced voltage. Thus, they generate lower power per unit area than a deployed, oriented panel. When solar cells are body-mounted to a spinning spacecraft, die array's total output power decreases because the cells are not always oriented toward the Sun. This decrease depends on the spacecraft's configuration and the drive mechanisms of the solar array (if any). For example, a stabilized array using Sun-tracking and pointing on two axes would fully use the solar array's surface area. But the array's reduction in output power per total surface area would be approximately jt for body-mounted cells on a cylindrical, spinning spacecraft and 4 for body-mounted cells on a cubic-shaped spacecraft that does not employ active tracking. The output power decreases because not all cells are illuminated We must trade the cost and design for the solar array's total surface area against the cost and complexity of stabilizing the spacecraft and using a drive system for the solar array. Shadowing considerations are important because a solar cell will go into open circuit (become high resistance) when not illuminated. In a series-connected string of solar cells, the shadowing of one cell results in the loss of the entire string. Shadowing may be caused by spacecraft components such as transmitting or receiving antennas, deployment mechanisms, or structures such as the solar-array. We can reduce shadowing effects by actively pointing and tracking solar arrays on 3-axis stabilized spacecraft, using diodes, or designing series-parallel arrays. On spinning spacecraft, we must lay out solar cells so all solar cells within a string are illuminated. Diodes, which bypass groups of solar cells in a string, help prevent damage to reduce the advance effects of shadowed solar cells. We can improve solar cell performance with coverslides, coatings, and back-surface reflectors. Coverslides provide a hermetic seal yet allow the cell to receive sunlight and reject heat They are textured or smooth. A textured coverslide is used for body-mounted solar cells that do not actively point toward the Sun. It reflects incident solar energy back onto the solar cell, improving the overall efficiency. Smooth cover-slides are used for spacecraft whose arrays actively track and point By decreasing reflective losses on solar cells, coatings allow cells to use more of the incident energy. Back-surface reflectors direct incident solar radiation that passes through the solar cell back through the cell again to improve overall efficiency. By reducing solar absorp-tance, they help the solar array manage thermal energy. Solar-cell vendors are continually improving the mechanical and thermal characteristics of coverslides, coatings, and back-surface reflectors. Thus, we must coordinate mechanical and thermal characteristics of these cells with the vendors. where cos 0 is referred to as the cosine loss. We measure the Sun incidence angle, 0, between the vector normal to the surface of the array and the Sun line. So if the Sun's rays are perpendicular to the solar array's surface, we get maximum power. Obviously, the geometry between the array and the Sun changes throughout the mission and different solar array panels will have different geometry. We configure the solar array to minimize this cosine loss. For example, in GEO with a flat silicon solar array and a worst-case Sun angle of 0= 23.5 deg angle between equatorial and ecliptic planes and the nominal value of the power output at beginning-of-life is 143 W/m2. Step 5. Radiation damage severely reduces a solar array's output voltage and current At geosynchronous altitude, we must guard against solar-flare protons on-station, trapped electrons on-station, and trapped electrons and protons during transfer orbits. (Chapter 8 explains these terms.) Electrons and protons trapped in the Earth's magnetic field cause most degradation of solar cells. Silicon solar cells protected by coverslides lose 15% of their voltage and current (shielding assumed) when exposed to a total fluence of 1015 MeV equivalent electrons (4 to 5 years for a LEO spacecraft). As mission planners, we should coordinate degradation characteristics with the solar-cell manufacturer, based on the radiation environment the spacecraft will encounter. Degradation of a solar cell also depends on its design. Advanced technologies, such as indium phosphide cells, are more radiation hardened. The resulting solar-array area for the example spacecraft is about 2.0 m2. If we had used a perfectly pointed array, the BOL power would have been 155 W/m2, resulting in an EOL power of 128 W/m2 and an array area of 1.9 m2. So, having to account for the cosine loss costs us 0.1 m2 in array size and the equivalent mass. Solar-array sizing is more difficult than it appears from the above discussion. Typically, we must consider several arrays with varying geometry. Also, the angle of incidence on the array surface is constantly changing. We must predict that angle continuously or at least determine the worst-case angle to develop an estimate of PE0L. Energy storage is an integral part of the spacecraft's electrical-power subsystem providing all the power for short missions (< 1 week) or back-up power for longer missions (> 1 week). Any spacecraft that uses photovoltaics or solar thermal dynamics as a power source requires a system to store energy for peak-power demands and eclipse periods. 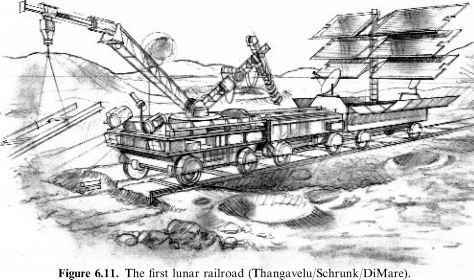 Energy storage typically occurs in a battery, although systems such as flywheels and fuel cells have been considered for various spacecraft. A battery consists of individual cells connected in series. The number of cells required is determined by the bus-voltage. The amount of energy stored within the battery is the ampere-hour capacity or watt-hour (ampere-hour times operating voltage) capacity. The design or nameplate capacity of the battery derives from the energy-storage requirements. Batteries can be connected in series to increase the voltage or in parallel to increase this current output—the net result being an increase in watt-hour capacity. Table 11-37 lists issues to consider early in the conceptual phase of any program. Most of all, we try to provide a stable voltage for all operating conditions during the mission life because load users prefer a semi-regulated bus voltage. The difference in energy-storage voltage between end of charge and end of discharge often determines the range of this bus voltage. TABLE 11-37. Issues in Designing the Energy Storage Capability. Energy storage usually means large batteries and we must consider all their characteristics when designing this subsystem. Fig. 11-10. 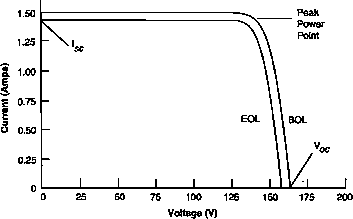 Profile of Charge/Discharge Voltages for Batteries. Secondary batteries may cycle through this type of profile hundreds or thousands of times during their mission He. At the left edge, the voltage Is low because the spacecraft Just came out of ecDpse where it used battery power. During the charge phase, there Is positive current from the power regulator, so the battery voltage rises. 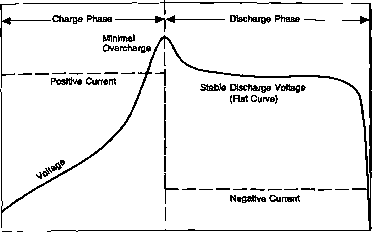 In the discharge phase (In eclipse again), there is a negative current, so the battery voltage decreases. most common batteries use silver zinc, lithium thionyl chloride, lithium sulfur dioxide, lithium monoflouride, and thermal cells. Table 11-38 highlights the applications and relative merits. It also depicts the wide ranges in each couple's specific-energy density. We cannot specify a value for specific-energy density because cells vary in design and depend on mission requirements. We must coordinate mission requirements with the battery manufacturer to specify battery performance.